I, Daniel, understood by the books the number of the years specified by the word of the LORD through Jeremiah the prophet, that He would accomplish seventy years in the desolations of Jerusalem. As he anticipated the return of his people to Jerusalem he surely realized that the time was close at hand. He had been taken captive in his teens and was now in his 80s. 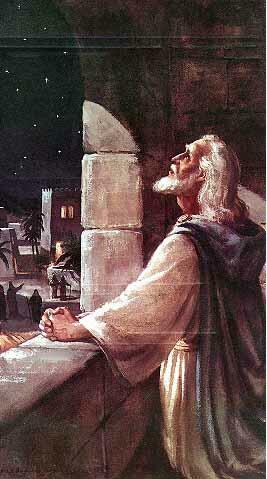 Every day he looked toward Jerusalem as he prayed. Every day he was aware of the times of the morning and evening sacrifices that would have been carried out if the Temple was still standing. His life was a life of devotion to God and His ways, even after all these years in captivity. Knowing now that the time was drawing near, motivated by love for God and a desire to see His will accomplished, he took God’s promise given through Jeremiah to heart. He knew that God was going to deliver the people. He knew that God was judging the people for their sins. And as the time of deliverance was close, he did not just sit back and wait for God to fulfill His promise. He took the assurance of God’s promise given in His Word through the prophet Jeremiah, and he prayed! He prayed for deliverance. Some would say that he did not need to pray, because God was going to keep His Word and prayer would not affect the outcome. But that misses the whole point of prayer. Daniel prayed not for what he could get, but for the sweet fellowship with His God. He did pray for deliverance. He trusted God and His Word. And prayer was a normal part of his relationship with God. We cannot view prayer simply as a means to an end. Prayer is part of our relationship with God. Any relationship will suffer without communication, how much more so when we are so dependent upon God for everything we need? We need to notice though that as he prayed he started by confessing sin. He knew that the people of God were in captivity because of their sin. What is amazing is that he confessed their sin as if it was his own. He did not pray for self preservation. He did not ask God to spare him because he was innocent. He did not ask God to remove him from the punishment for the sins of others. He saw the sins of the nation as his own sin and he confessed and repented before God. This is amazing because Daniel is one of those rare people in the Scriptures about whom nothing negative is ever said. He is only said to be faithful and obedient, a shining example of holiness and devotion to God in the midst of a pagan culture. As he repented and prayed, he pleaded with God to deliver His people. And God heard his prayer. In fact, the answer God had for Daniel was so urgent that God dispatched the angel Gabriel with the answer before Daniel had even finished praying. The answer to his prayer for deliverance was a prophecy known as the Seventy Weeks prophecy. It is the backbone for second coming prophecies and has been interpreted and re-interpreted numerous times. We all decry the wickedness of our nation. But how many of us have prayed and repented as if it was our sin we were being judged for? “We have sinned and committed iniquity, we have done wickedly and rebelled.” Do we see it as if it is us against them – the righteous against the wicked? Or do we truly underdstand that the sins of this nation are our sins? As Daniel was praying and confessing the sin of His people Gabriel was sent to give him a message, to answer his prayer and plea for deliverance from sin. That answer is the “seventy weeks” prophecy. What we miss in trying to understand all the specifics is that the answer was that the Messiah was coming. The answer was Jesus! Once we see Jesus as the solution for sin we can focus on the details of the “seventy weeks” prophecy. But we have to keep in mind a few things. First, Jesus is coming from Daniel’s perspective, and He is coming again from our perspective. Second, keep the details in context. If we do not understand the first 8 chapters of Daniel, then we cannot hope to pull chapter 9 out all by itself and make any sense. 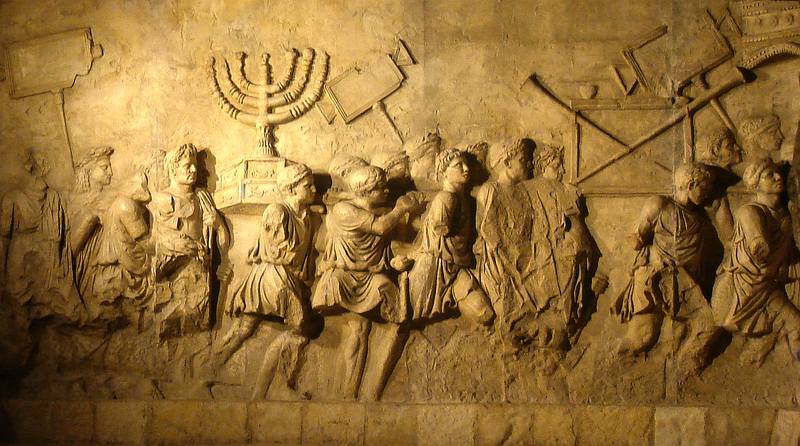 Arch of Titus depicting the conquest of Jerusalem.